I fell in love with Philadelphia the first time I went there so I felt like I needed to go back there on my second visit to the US. I know, I know! I said that I will stay there for a longer time on my next visit however, I am once again constrained in time. I fell sick during this holiday of mine which had a huge effect on my travel plans. So once again, I had only about 12 hours to spare to see what Philadelphia has to offer which I didn’t see the first time I went there. We left Maryland to start our 3-hour drive to Philadelphia at around 6:30am. We went through the backroads which I think was a much better choice over highways. We arrived Philadelphia at around 10am, just in time for us to have breakfast. We immediately looked for a parking space near to our first destination and then I was reminded once again how incredibly expensive parking fees are in Philly, probably the only thing I hate about it. 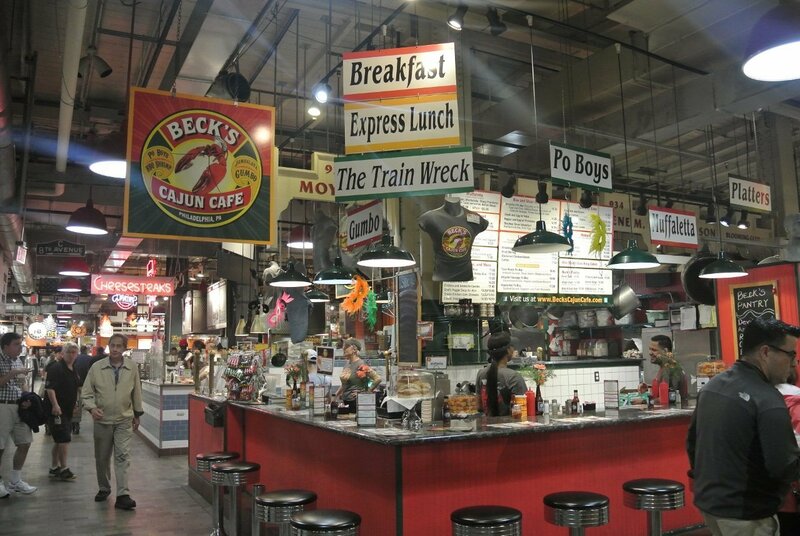 Food stalls offering different cuisines in Reading Terminal Market. Our first stop was Reading Terminal Market, a place in Philadelphia which I only found out through one of the bloggers I follow – Dee Gilbert. She posted her blog about this famous culinary destination in Philadelphia after my visit in the city and I made a mental note to go there as well if ever I find myself back in Philly. My sister and I decided to order some breakfast dishes from Dutch Eating Place, which I only found out as I write this blog that Dee also had her lunch in the same food stall on her blog post. Hah! It was pure coincidence since it was my sister who decided to have our breakfast there. Note: There’s a public parking space right across Reading Terminal Market. USD21 parking fee for 60mins. Note: There’s a public street parking just outside the entrance of Eastern State Penitentiary which is free for the first 2 hours. The whole tour inside the prison took us about an hour including the audio tour and a tour on our own inside the prison grounds. 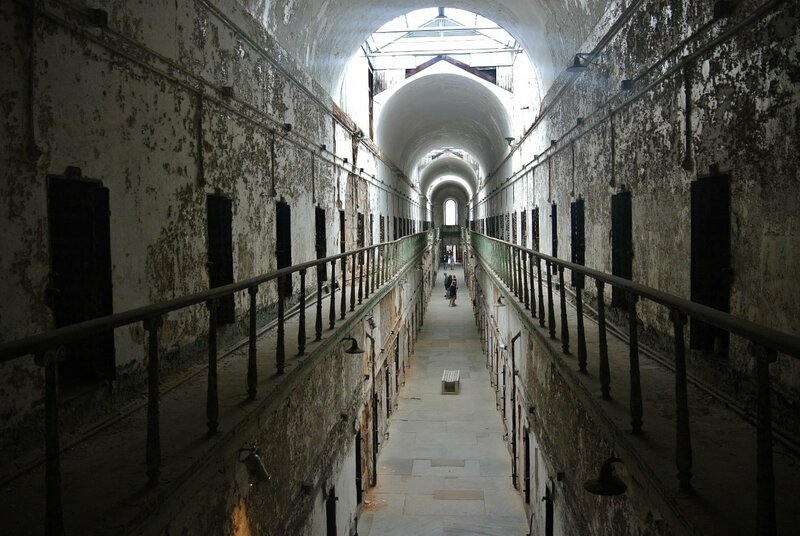 Related Blog Post: Things To Do in Philadelphia: Take a Look at Life Inside Eastern State Penitentiary. We then proceeded to Philadelphia City Hall in the hopes of being able to access the Observation Deck however, we were informed that the tickets to go inside the City Hall for a tour and to access the observation deck is already sold out and the next available tickets are only for October. My heart broke upon hearing this so we decided to spend some time at the nearby Love and Dilworth Park. Related Blog Post: Photo Blog: Philadelphia, You’re Absolutely Lovely! Afterwards, we went to Philadelphia’s Magic Gardens – an incredible and beautiful visionary art environment full of mosaics created by Isaiah Zagar. I enjoyed my time here and although I’m not really into arts, this was actually very interesting for me. Expenses: USD7 entrance fee per person, USD3 street parking fee for 45 minutes. We drove towards the Independence Mall afterwards but then again, we were informed that tickets for the day are already sold out once again. It actually is frustrating even though I know that it is my own fault for not planning everything ahead of time. I wish Philadelphia was much more like Washington DC where every single tourist destinations that I’ve visited are for free, even the museums. Anyway, with a heavy heart – we went to Blue Cross RiverRink, a favorite destination of ours when we went to Philadelphia last year. The last time we were in Philly, it was a few days before Christmas so they have decorated the whole place to look like a Christmas village – complete with ice skating rink and a lodge where you can get drinks and food. This time though for summer, the ice skating rink became a roller skate rink while the lodge lost its winter cabin feel and was now looking at lot more vibrant for the summer. We were there quite early so we had the place to ourselves. This was where we stayed the longest to eat, drink and gossip. It was our last destination for the day after all. Related Blog Post: Things To Do in Philadelphia: Feel the summer heat at Blue Cross RiverRink Summerfest. Getting sick on a holiday. It does look familiar even to me but I thought it was just because of the photos I’ve seen of it. However now that you’ve asked, I had to do a research and apparently – there’s quite a lot of films done here – FILMED AT ESP.